Everything you need to know — and other fun facts — about the royal wedding. Millions will be glued to their television screens, iPads, iPhones or streaming devices to watch Prince Harry marry American actress Meghan Markle on Saturday. The wedding promises elaborate fanfare and is the culmination of immense planning efforts. Here’s everything you need to know — and a few fun facts — about Saturday’s big event and the couple. The wedding will take place on Saturday, May 19, at St. George’s Chapel, Windsor. The chapel took 50 years to complete during the reign of Henry VII. Around 600 people are invited to the wedding ceremony and around 200 people invited to the reception being held at Frogmore House. The invitations are from Barnard & Westwood, the official printers for both the Queen and the Prince of Wales. The invitations feature the Three Feather Badge of the Prince of Wales. Around 100,000 people are expected along the processional routes. Prince William will be Harry’s best man. Meghan Markle will not have a maid of honor for the ceremony. Meghan's dad will not walk her down the aisle nor will he attend the wedding. Prince Charles will instead take his place. Prince George and Princess Charlotte is expected to be leading the bridal party down the aisle on Saturday. Floral designer Philippa Craddock is creating the displays at St. George’s Chapel and for St. George’s Hall. Craddock has a studio in Fulham and a flower shop in Selfridges. Pastry chef Claire Ptak, owner of London-based Violet Bakery, is creating a lemon elderflower cake covered with buttercream and decorated with fresh flowers. Alexi Lubomirski is the official wedding photographer. Lubomirski also took the couple's engagement photos. The music will include a number of well-known hymns and choral works. The music will be under the direction of James Vivian, director of music for St. George’s Chapel. A selection of choral groups, soloists, and musicians will perform. 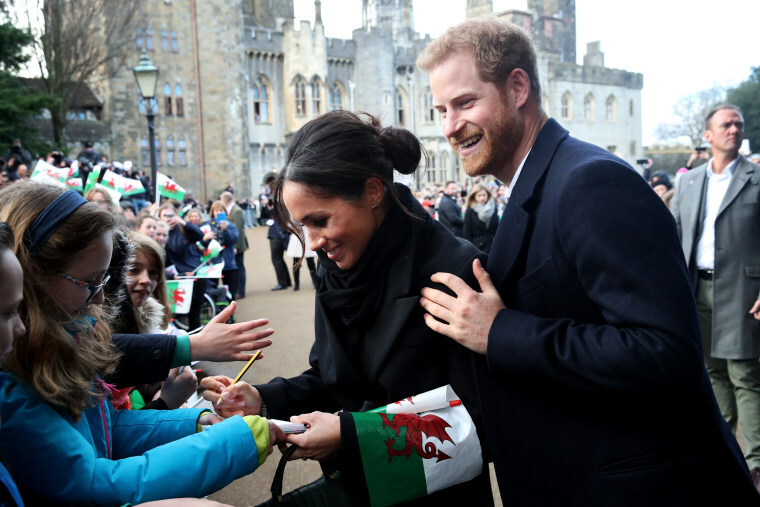 Harry and Meghan are asking that instead of gifts, people give to charity. They chose seven charities that represent a range of issues they are passionate about. Harry and Meghan: Did you know...? She is most well known for her role of Rachel Zane on the USA Network legal drama “Suits” but her first role was on the soap opera "General Hospital," which featured the famous 1981 TV wedding of Luke and Laura. Genie Francis who played Laura told Katie Couric that, in real life, Princess Diana sent the TV couple a bottle of champagne and a personal note for the fictional occasion. Harry didn’t know who Meghan was before they met and she didn’t know much about him either. In their first interview together with the BBC they revealed that they were actually set up on a blind date by a mutual friend. There has been a lot of speculation about about the friend in question but the couple has chosen not to reveal who it was. They dated for six months before the relationship became public. Meghan interrupted Harry’s proposal. Before he could finish asking her, she interrupted with, “Can I say yes now?” They were at home roasting a chicken. Meghan’s engagement ring was designed by Harry with a gold band. The main diamond is from Botswana and two other diamonds are from Diana's personal collection. Meghan was raised Protestant but attended an all-girls Catholic high school. She was baptized into the Anglican Church in March 2018 by Archbishop of Canterbury Justin Welby. A head of the Episcopal Church, the Most Rev. Michael Bruce Curry, will speak at the wedding. He is from Chicago and the first African-American to have served as presiding bishop of the Episcopal Church, an offshoot of the Church of England in the United States. Meghan did not have to be an Anglican to marry into the royal family but reportedly chose to be baptized as a sign of respect for Queen Elizabeth’s role as head of the Church of England. This will be Meghan’s second marriage. The couple will live in the two-bedroom Nottingham Cottage at Kensington Palace after the wedding.